Start. Start as early as possible. One wish. A wish that we could have started sooner. Our daughter and her husband live near East Lansing. You’ve met Lindsay in the past — featured in our August 2009 cover story. Investing really can be all about moments, moments of truth during a lifetime and the freedom that can be discovered by doing it well. Grandma joined us as quickly as she could and headed for Labor & Delivery. Over the next several hours and days, I gained some new attire and any number of Michigan State Spartan shirts and sweatshirts. (There are a lot of Spartans around here.) We also gained our first grandchild, Lincoln Richard Hurst. He is wonderful. I can now forgive my parents for those times when Wendy and I seemed to be suddenly invisible while Grandpa and Grandma rushed to hug their grandchildren. I get it, now. Welcome. We’ve been waiting for you since the moment your mother said you were incoming. You are a gift and as evidenced by that record-setting horde in the hospital waiting room, there’s a whole bunch of people who care about you. Care back. Care often. You were born on John Lennon’s birthday. You will learn more about him and will likely enjoy much of his work known as music. His song Imagine (1971) has always been a favorite and urges “Dream … Imagine all the People… Sharing all the World…” Dream freely. Dream often. No. Girls are NOT less capable when it comes to math or investing. Far from it. But (collectively) girls can be overly cautious and drawn to things labeled “guaranteed return” when something else is more appropriate. Your grandmother discovered this a few years ago with her own investing account. Your grandmother is not alone and she is VERY CAPABLE. Comparing Predictions vs. Results. First thing to remember: Stock prices fluctuate. Mr. Bogle is right. The average 4-year forecast for the span shown here is 8%. The average 4-year annualized return is 6%. 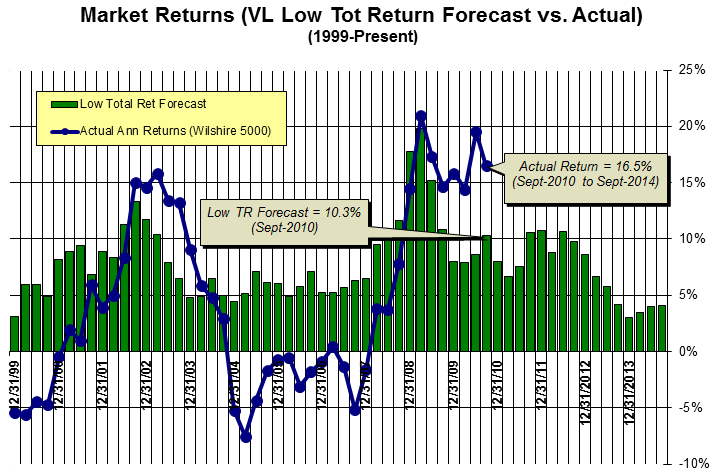 The forecast bars on the right hand side remain near historical lows. But for someone 6 days old, we’ll be investing. Investing regularly in the best companies because that’s where magic, miracles and Freedom can happen. A great man named Jack Bogle also shared that “The typical worker saving diligently since 1982 should have had $373,000 in a qualified plan by age 60. Instead, that saver has $100,000…” Mr. Bogle is the founder of Vanguard, created the original index fund and is a proponent of passive investing. He’s been doing this long enough that we should heed his warnings about long-term return expectations and excessive costs. You will hear about the wealth gap. Another way to think of this is that some people have more freedom to do the things they want (or need) to do than others. Some people want to have enough resources in order that they can freely help others who need it. Help others. Help often. All of these gaps represent a massive opportunity. Because learning is the answer. Your mother is a great teacher and much of this will probably come natural to you. Your father is one of the hardest working people I’ve ever known. One of the best solutions to the quest for Freedom was inspired by a man named George Nicholson, Jr. a little over 70 years ago. He inspired the concept of investment clubs and nurtured the notion of a people’s capitalism — the power of mauling the mysteries of long-term investing that can enable dreams (remember John Lennon) to become true. Big words, perhaps. But really as simple as imagining that Freedom is possible. Imagine freely. Imagine often. The recipe is pretty simple. Invest regularly. Invest in the Best. Collect, care for and accumulate the best companies when they’re “on sale.” Do this with friends. Tell your friends. Share. Share often. One of your great grandfathers speaks of his investment club experience as “money from no where.” “It seems as simple as scraping the spare change off the refrigerator and — with time — it becomes a surprisingly large amount of [Freedom. ]” Another great grandfather describes an investment conference where he and your great grandmother had a fascinating discussion with a nice person from a company called Biomet. $2000 invested in Biomet in 1982 was worth nearly $1,000,000 in the late 1990s. It’s a fact. (For more, see Raise A Cup: Million Dollar Moment — April 2012) It’s also potential freedom. Magic and miracles happen when given a chance. Within a few days of your arrival, we started an online account with your mother’s help where we’ll be stashing a “Lincoln” or two on a regular basis. The Bare Naked Million dashboard is now up to $2,237,475 (10.9% per year) and is built using a moderately passive approach. The core is the Vanguard Growth Fund (VUG) and is supplemented with industry leaders when their return forecasts are elevated. There have been two selling transactions since inception. By comparison, investing that million dollars into the Wilshire 5000 (VTSMX) would now be worth $1,613,900 or 6.4% per year. That +4.5 percentage point advantage is HUGE over time. Our Lincoln Fund will have much more modest beginnings (like $0, true shoestring genesis) but will grow and build in the years ahead with little effort outside of summoning the necessary discipline to accumulate regularly. We’ll watch for opportunities to latch on to leadership companies but the heavy lifting — much like the Bare Naked approach — will come from investing in baskets like VUG for a while to come. For now, Welcome to the Club, Lincoln. Imagine at will. Often. Manifest Investing is all about achieving success as a long-term investor. It is a subscription research site featuring actionable ideas, tools and resources for portfolio design and management. Apply for a “test drive” at http://www.manifestinvesting.com The annual subscription is $79/year. Questions: markr@manifestinvesting or @manifestinvest Come discover and experience the lessons of over 70 years of investing with friends.